Constructive wallowing seems like an oxymoron. Constructive is a good thing, but wallowing is bad. Right? Almost everyone loves the idea of self-compassion. The notion that maybe in spite of our messy emotions and questionable behavior, we really aren’t all that bad. In recent years there’s been an explosion of books that encourage readers to stop beating themselves up for being human, which is terrific. Unfortunately, readers who aren’t interested in Buddhism or meditation have been left out in the cold. 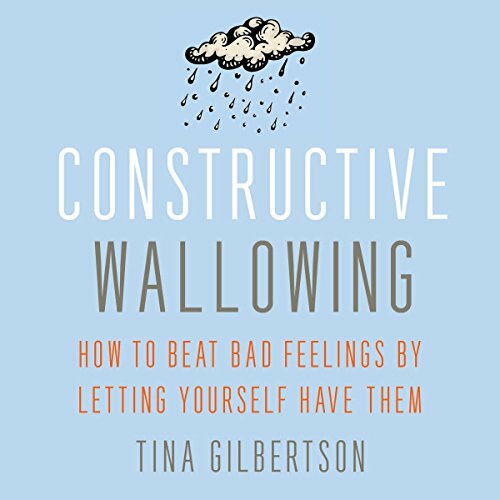 Constructive Wallowing is the first book to cut right to the chase, bypassing descriptions of Eastern philosophy and meditation techniques to teach listeners how to accept and feel their feelings with self-compassion for greater emotional health. It’s tempting to turn away from menacing, uncomfortable feelings like anger, grief, or regret; however, ignoring them just seems to make them stick around. By learning to accept and embrace, difficult feelings, listeners keep their sense of personal power and gain greater understanding and ultimately esteem for themselves. OK but not a great book for “listening to”. The narration itself was clear & friendly enough but WAY too rushed for this kind of information. Come Chapter 4, I was searching for the speed function to slow the speech & manually pausing on a regular basis, (almost every sentence at one point)- which is fine in itself but, what the heck is wrong with natural pauses here & there? Why must everything be so rushed? It turned into hard work (for me anyhow ‘cos I don’t want to miss anything ‘key’). This is info you need to absorb & reflect upon or else it just becomes “bambalamblah“. I’d advise to get yourself a hard copy on this particular book otherwise it’s all too much at once therefore, you end up missing some important points that occasionally crop up. Where does Constructive Wallowing rank among all the audiobooks you’ve listened to so far? It's a how-to book. So, I can't say I have favourite character. What does Kimberly Mintz bring to the story that you wouldn’t experience if you had only read the book? Too many moments to choose from. I would highly recommend this book! Great insight into the life cycle of feelings and the importance of allowing yourself to feel your emotions. A bit repetitive about the pros of why you shouldn’t repress your feelings, but ultimately drove home the point.